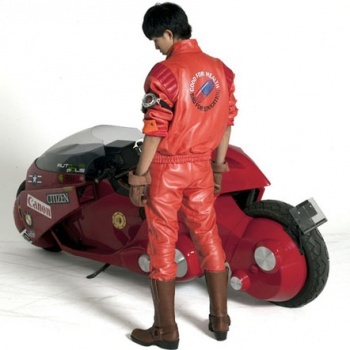 Remember that awesome red jacket Kaneda wore in Akira? If you've got the cash, you too can own one. In 1982 Katsuhiro Otomo unveiled Akira, a manga that would go on to spawn a beloved anime film and influence far more aspects of pop culture than I have room to discuss. It was a big deal, is what I'm saying here. The story's protagonist, Kaneda, is a teenager who is notable for three reasons: First, he has a wicked sweet motorcycle. Second, he leads a gang of similarly equipped teens in dystopian Tokyo. Third, his signature jacket is the coolest piece of aged leather this side of Keith Richards. Also, there's something about saving the world from a living nuclear allegory, but the details are kinda fuzzy. In celebration of the manga's 30th anniversary, Bandai Namco has recreated the iconic jacket in all its crimson glory, and is now offering the duds for sale. Unfortunately, there are two caveats to this story. Not only is the jacket only available to those willing to navigate a circuitous Japanese website, it's also priced at Â¥69,800. That's $910 US dollars. Now, before your dreams deflate entirely, let me point out that the jackets are available in a wide range of sizes. Everything from S to XXXL, so those of you undergoing shady government experimentation that has left your body a swollen, gelatinous mound of psychokinetically charged flesh can still likely find one in your size. Plus, for added realism, in case that last scenario is a bizarrely prescient description of your current situation, Bandai Namco has also crafted a replica of Tetsuo's black jacket, though you'll likely have to provide your own cape.